Hey lovely friends! I hope your Christmas was wonderful! wow.. ours was crazy and fun and quiet and tiring and loud... all at the same time. I am PLUM wore out! But i was able to spend some time in my studio with my kids before Christmas. Took a couple of days off to just really hang out with them, and my husband and get some much needed holiday stuff underwrap. I started another painting.. from one of the sketches I did.. but I am not really happy with it as of yet.. This is the sketch I had done earlier.. I LOVE LOVE LOVE the sketch of her. I even love her face. I usually don't like faces, but I do like hers. Well So I got to town and painted her.. and this is where I got too.. TOTALLy not the same. I mean it's kinda.. but don't love the face. Mostly because it instantly gives her this personality that is kinda set in stone. Girls without faces, leave the personality and soul to be determined by the viewer.. and she has a very distinct look to her. Which is okay, I guess? The background is way to crazy busy. I will be changing that. that's the awesome thing about art! Always changing and always evolving! who knows.. maybe by the time she ends up on my wall, she won't have a face again? lol.. I also was able to paint something for one of my besties.. Meradith. She is one of those special friends that you just have a hard time getting them something because you want it to be so special and usually a shirt or a pair of earrings just don't do it justice. So I decided to paint something for her. I wanted to paint something that was a little more abstract and home decor.. than artsy and crafty. That she could hang in her living room. Earlier this fall I took a class with Floral Bowley and LOVED the techniques I learned in that class.. I took some of the techniques i learned with her, some I had learned with Mindy Lacefield and then of course my favorite techniques for adding textures (inks, rubons, stamps, etc) and created this for her. It's a large painting.. 24"x36"
Lots of flowers and doodles and rubons, everywhere. I dropped it off. I HATE seeings peoples reaction when I give them a piece of my art.. but her husband sent me a picture of her after she opened it and she also texted me and said a HUGE thank you! So I was glad that She liked it! Speaking of Art.. a few months ago.. my husband I were looking at "marriage" retreats we could go on. We really needed some one on one time with each other and we also wanted some quiet and relaxation. We had thought about waiting until our anniversary, but summer is always so crazy for us.. so we decided to just look and see what was out there and go when we found something that sounded what we were looking for. Well we looked and looked and honestly couldn't find something that remotely sounded both relaxing and fun. A lot of great retreats.. but most time spent in "therapy" sessions, which while I am SURE those are fun and effective.. we just wanted to be together. Well I had been following this artist named Jesse Reno. Hes a VERY abstract Artist.. really kinda crazy art and I actually LOVE it. Something I would probably put in my family room or a game room. Or a boys bedroom. Just really fun stuff. Well I found out he was going to be teaching at an art retreat in Mexico.. a 5 day retreat. You are in class only 4 hours a day, the rest of the day you could spend still painting, either in the open air studio or around the grounds.. or whatever you wanted. VERY low key, Small group, your housing, food, etc.. is all included. It is held on private grounds.. in a small hacienda.. and it has a beautiful backyard.. GORGEOUS grounds.. lush green trees, quiet and secluded. A swimming pool, little places to read, and hammocks to take naps in. I was DYING.. i had a plan.. and i was SOO hoping Ben would go along with me! I thought it would BE SO MUCH Fun to go to THAT as our "marriage retreat". Just didn't know what Ben would think about that! l I mean I wasn't just asking him to go and hang out while I took the class.. if he came he would be COMING to be a student too! Paint right along side me! ol. So I presented him with the idea.. and I was amazed and THRILLED when he said.. okay! that sounds fun! Now keep in mind.. my husband has NEVER done art with me before. He doesn't paint. He has done craft projects of his own (he decopuaged his gone once, he's made painted puzzles for my kids, he made his own rag quilt blankets and he recently made me a gorgeous wrap bracelet for Christmas!) But he hasn't never really done mixed media art... And he said SURE! and was even a little excited! Soo.. that was month's ago.. and we leave SUNDAY!! I actually have been having withdrawls of leaving my kids. But I know they will be fine. We travel all the time.. but for some reason this time I just have felt more anxiety than usual. But ben still wants to go and I am still excited and we NEED this for us. WE need to focus on just us for one week. ANd I am truly excited we get to be doing something fun, low key but also adventurous at the same time! Jesse Reno's art is REALLY very much something I think ben would like. Something He could do and that wouldn't make him feel girly. It's very masculine.. so I am actually really excited to see what Ben can do. I know he will create something beautiful! So that is what we are up to! Heading to sunny Mexico.. odd timing.. but you can't pick the art retreat dates lol. So i have been working hard yesterday and today to get work done before I go. Lots to buckle up and get checked off. So I guess that means I better button up this post! lol. Well you will be HAPPY to know I videotaped the December mixed media kit video! I will be sharing that with you next week on Tuesday! It's set to air while I am gone. I also have that post finally I want to share with you about the glitter canvas project. I figured it wasn't really a "holiday" craft.. it is more of a home decor craft, so I could show that tutorial anytime! So watch for that too! Hope you have a happy friday! AND hope you had a WONDERFUL Christmas.. and a VERY HAPPY NEW YEAR!!! can't wait to share 2013 with you all! I have some fun classes coming up and other projects. that I will announce and share when I get back! First one will start end of January! Wahoo! happy Friday!! Hey friends! So ya.. kinda went MIA this last week.. trying to get stuff done for Christmas, keeping on on work stuff. Many of you don't know but Melanie doesn't work for us anymore.. as the customer service email girl.. she was so awesome!! We wil miss her! She just had other opportunties come up .. and she was just supposed to be on for me, helping me through the summer until she went back to work, and then I would find someone else.. but she was SOO sweet to stay on until last month! So the last month I have been trying to juggle that and all she did with my normal stuff. Yea.. so it's not really giving me much free time! But I am hoping to have someone new hired by the first of the year! Well yesterday I decided to take the day off, I had just seriously had enough of work. I have worked everyday.. EVERY Saturday in who knows HOW long and while I had spent some time on the weekend with my kids at the studio.. I hadn't done any "Me" painting yet and I had in my mind this indian she girl I had sketched over 2 months ago i think! And wanted Soo badly to put her on canvas. and wouldn't you know it.. I got sick lol. Started feeling feverish and achy about noon and ended up going home for the rest of the day in bed.. go figure! lol. But I did get some of her done.. or most of her done before I went home.. so that was good! So here is just a peek at her.. She's not done.. but I think I am in love with her.. (now I see the sketch.. I see I didn't put the embelishments on her arms and I really like that! lol. Maybe I can add that today Lol. Her headdress got a little bigger than I wanted. oh well. I already am itching to paint THIS one now (another one of the sketches I shared a month ago).. Anyhow.. enough of that! Lol. THE point of this post actually was to basically let you know I was still alive AND that I did have a post for you all set and ready to go last week about the canvas deer projects My kids and I did last week. .. that just required a few pictures I wanted to take. Well I have the pictures done now.. just need to tweak them a bit but Margie is going to be here in 45 mins and I really should put a bra on and brush my teeth and head out to the studio to meet her :) lol. Snow Globe Craze.. let's get crafty! Well if you are following me in instagram or facebook.. you might know that this past weekend, Allie and her friends.. and Ben and my son Preston.. had a "craft night" saturday night. Allie had seen on Pinterest, a deer glittered on canvas.. that she REALLY wanted to make. Not for herself.. but she said she knows I LOVE deer anything right now.. and she wanted to make it for me for my Christmas Decor. I had seen the fun pins going around on Pinterest of the simple waterless snow-globes.. and I knew I wanted to try my hand at that too! I figured BOTH would be super fast and easy projects.. we could definitely get done in one night. And I was right. SUPER easy and fast. This week I wanted to share with you what we did and maybe give you some ideas that you could do for all year long! The first one I am going to share is the snowglobes. These are waterless snowglobes, so they don't require anything super fancy. Just a few simple things, you might already have around the house. First you need empty jars.. they can be canning jars, empty pickle jars, jelly jars, mayonnaise jars, etc. ANY Kind of jar will work. Ben washed them for me really good and we pealed off the labels (Magic Eraser works good for that. Or just soaking it in warm water for a bit). I even used some super small jelly and mustard jars.. you know the kind they give you at restaurants or in your hotel room when you order room service? And salt and pepper shakers (got mine at the dollar store). You also need some type of snow. You can find different types of flakes and glittered snow at ANY Craft store and even Walmart in the Holiday Section. I also used super find glitter with some of the smaller globes because the pieces were so small, the other flakes just overpowered them. So keep in mind Glitter works too! The girls even used some of the colored glitter lightly mixed in with the snow flakes.. just to give it a TINY bit of color. Not too much though. I kept mine to mostly white. Then you need to gather things to put inside. This is where the fun part begins. There are NO rules to what you can put inside your globes! Some things I found just around my house (I collect lots of birds, and I use old goblets turned upside down, to set them on).. So I thought those would be fun inside! I also gathered a bunch of small figurines that people had given me over the years.. it kids got at school. Some of them I found at craft stores , but most I found at thrift stores. Most were like .25 cents to .50 a piece. Ornaments work GREAT too! ANY type. I used the Nesting Doll ornaments I made in the 2012 Artsy Ornaments of Christmas class. Make sure to keep them small. They have to fit inside the opening of the jar mouth. My FAVORITE thing to put inside are the small sisal trees. Bottle Trees as they are called. You can buy packs of them at Michael's. Usually 12-20 in a pack and they range in price from $6.00-$8.00. BUT right now everything is on sale.. so i know you can get them cheaper. Joanns, Michael's, Hobby Lobby and even Big Lots carry them. I think Target does too. They come in different colors but usually the white ones or colors BESIDES green are more expensive. SO it's EASY to color your own (I show you how in the Pumpkins and Cider workshop).. You simple soak them in bleach and water (half and half) for just a few minutes and it removes all the color. Then you can leave them cream.. OR you can re-color them the color you want using Sprays and Mists (like color wash from ranger, studio calico spray, etc)! (or spray paint). This is where you could change it up depending on what your color scheme is. OR even go outside the box and make these for different seasons and holidays! Like think about coloring some pink and red for valentines day and making a valentines snowglobe, Or a spring one.. or easter. Fall, Halloween, etc. These are a set of trees I did for fall.Some are in globes and some I just used in trays.I made these in the pumpkins and Cider workshop. I showed how to do patterns on them.. stripes, polkadots, etc. These are kind fallish.. BUT image if your tree is pinks and greens! How fun for snowglobe! This is a set I just glued to the top of an old book cover, for Halloween but NEXT year I will be moving it into a jar.. Okay.. so enough with the trees lol.. So you can certainly make them without making them permanent. Then you just go to town! Then you just go to town! You glue the items to the inside top of the lid of the snowglobes. Then you add the glitter and snow to the jar side.. and then carefully put the lid onto the jar, and then turn upside down and the snow falls down onto all the fun things you glued onto the lid! Now if you find you put too much snow on it. No worries. Just unscrew it and take some out. Easy Peasy! One MORE thing to note. my jars had all different colors of lids. BUt for ME i like that I like that they are jelly lids or mustard lids and they say words on them and are colorful. That is my studio.. and I like also incorporating things that are "real" or authentic.. so keeping them looking like they are homemade by not changing the lid color worked for me. Even with the canning jar lids. I tried to actually use the ones that were old and discolored. HOWEVER if you are doing it for say a room that is all cream and gold.. you wouldn't want all the different mixes of colors and you might want it to look a bit more professional. So first you would want to paint the lids before you start. I suggest just using good old fashioned spray paint. Paint them all cream or silver and you are good to go! So fun! Some of the snowglobes I did opposite. Like the hanging ornament. I glued the string to the lid.. and then place the jar right side up. So it hung down from the lid. So you can do it either way! Once you have them made.. then you can create "scenes" with them. You can put them all together in the center of the table, or you can spread them out here and there throughout your house. YOu can also stack them on things. like candlesticks or cake stands, etc. to give different heights to them as well. Here are just a few of the shots I took. Keep in mind you can keep some of your figurines, trees, etc.. OUTSIDE of the globes and place around them. WHich is fun when creating a table centerpiece. I even used some of the pine cone ornaments i made in the 2012 Artsy Ornaments workshop. TRULY the possibilities of what you can put inside are endless. I also had the idea, that you can make ANY type of snowglobe. Doesn't have to just be in a "jar" or a globe. I had an old birdcage I bought.. big and tall and didn't I thought it would be fun to put a "setting" inside of that instead of just a regular candle like most people would do.. look how FUN it turned out! So think outside the box when creating globes! I just have to say.. I LOVE pinterest. It's such a WONDERFUL place to get ideas and learn and be inspired by other people. TRULY! if you aren't apart of it.. you will have so much fun if you are! It's free and just a great place for inspiration! anyhow.. can't wait to see what you come up with too! I bet it will be FABULOUS! Thursday I am going to show you the deer glitter canvases we made.. HOWEVER i am also going to show you some ideas for other shapes you can do as well! AND I keep forgetting to remind everyone.. the LIFE BOOK 2013.. Starts in just 3 weeks!!!! 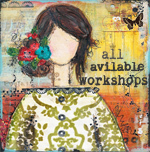 It's an online art journal workshop that goes for 12 months! I along with 12 other FABULOUS teachers are teaching this workshop! Effie Wild, Melody Ross, Danita (from Danita Art), Julie Balzer, Mindy Lacefield, and SO SO Many others! I am actually the first teacher of the year.. Mine journal page and technique video goes up in Janaury.. SO COME JOIN US!!! it's a pretty cool book. YOu make an entire art journal. Over the course of 12 months. And finish it off with Tammy showing you how to bind your journal and make it a beautiful keepsake! SO fun! I will be posting more about my own new classes.. starting in January (I have two).. in the next couple of weeks. One is a fun basic mixed media course. with EVERYTHING you need to know about mixed media technique. The other will be a year long class as well. Each month a new canvas and project. It's gonna be really really personal and a workshop that I hope will help you grow both creatively and as an individual! More on that in a few weeks! OH and for those of you who are on the "waitlist" for my art retreats i am having here at the studio in may.. I will be emailing you in the next week or so about those. I started thinking maybe i should give you the info NOW so that if you wanted to ask for it as part of your Christmas present.. you could! lol. It's a good way to have the hubby pay for it.. instead of it coming out of your own "craft" stash lol. So if you are on the waitlist I will send that out to you first! We will have two different retreats in May. Back to back weekends. So anyhow.. lots and lots of fun things for 2013!!! So.. I thought it would be fun to take a break from art and online classes and share with you some of my favorite holiday gifts. Nothing fancy, Just some fun personalized gifts I am giving this year for Christmas. ALL of which I have found On Etsy. I love etsy!!.. mainly because for one, I LOVE supporting artist! It's such a unique and awesome thing that we can access art from all over the world in one little spot. Crazy huh? I love supporting them, but I also love giving handmade or personalized things. And really you can't do that with store bought items. So here are just a few.. truly not very many.. but a few of the things I have got for friends or family for Christmas this year.. So another bonus of etsy.. is that you can usually contact the seller and have something personalized even more so than what they offer. I loved this cute little idea.. but thought it would be fun to give them to my friends based on the place they were married to their spouse. I also thought it would mean even more if the initials of them and their spouce were on either side of the heart. So I contacted her and of course she was awesome and said yes! I LOVE how they turned out! These were only $14.00! and yes i know I could have made them, but I had so many other projects I was making, I decided for the price, these were well worth the money spent. OH SO CUTE! And she even finished the backs.. It was funny because our last house they were a little more obvious (one was on the ceiling of the main bathroom right above the tub, so when you are taking a bath, you can see it. I didn't find that one for about a year, because i never take a bath in that one, but my son was one day and starting yelling.. I FOUND ONE! Another one he put right by the light switch in our bedroom and he had carved it right into the sheetrock. So when we sold the house to some neighbors, they called me about a week or so after they moved in and commented on them. I was like.. oh yea sorry. Just pretend they are magical parts of the houses history! Lol. Or cover them up :). I remember the first one he did was about a month before we got married. He was painting this little old studio, that we were going to move into when we got married. And one day I was driving around to the other side (the side you don't see from the driveway) to park and bring some stuff in and I saw this HUGE heart with b+c on it in green.. over the cream siding. I mean HUGE! It covered the entire side of the house. He kept it there until we moved. What a guy huh? I mean WHO does that kind of stuff? The funny thing is..that is about as far as his romantic side goes. He's not the mushy type at all, that writes mushy notes all the time, or talks about his "feelings". lol. So it's kinda fun that he has this "thing" he does that let's me know he loves me. So this is how it turned out! and again for $14.00.. for a handmade personalized ceramic plate.. for a christmas gift? Pretty darn cheap! This would make a great gift for parents! Put their initials on it and maybe the date they were married? how fun! The next to last gift item I got.. okay I have to admit.. was for myself. A hand-stamped Ring. I really wanted a new ring for my right hand and this year has been a hard one for Ben and I.. but we have ended up coming out of it even BETTER than we have ever been! We have been married for almost 19 years! ANd I am sure every marriage goes through bumps along the way. I know we have.. and this year was especially hard for us.. but over the last several months. I have grown SO close to this man. I can't even explain the gratitude and love and charity I feel for him. It hasn't always been like this. I mean I have always loved him, but I don't think I have EVER truly TRULY appreciated him or the love he has for me. He isn't perfect either and we are kinda both pig headed, people.. but over the last year I think we have learned to respect each others ideas, to look at each other from a different perspective. I use to be a "all about me" person when it came to our marriage. I have never been one to "serve" my husband. I haven't ever been the one to leave fun little notes in his lunch, or clean up something for him when I know he is having a bad day, or whatever. you know what i mean. He always does it for, but me.. never really for him. But now, I have this HUGE sense of service and charity towards him. I am often times now finding ways to show HIM I love him. Getting him little gifts. SHowing up at the warehouse with a packed "picnic for lunch. Making our bed or turning down his side of the bed before he comes to bed. Cleaning our bedroom with from MY mess, so he can walk in and find it a relaxing place to be (i am pretty messy.. if you can believe that .. and I am sure you can! Lol) Just stupid silly things that I have HONESTLY ever done before. So I wanted to get a ring to wear that would show him how i felt about him. That he knows even though I have a set of "trues" i always go to for everything (my closest girlfriends).. he is my TRUEST of trues. So I found this ring on etsy..
OH so cute! It was exactly what he had been doing for me for years! Hand-carving b+c in so many random things. This ring was just perfect.. handcarved and looks like a tree.. in LOVE! it was $35.00 which for a RING period.. is an amazing price.. but a personalized one?? holy cow how could i not! So while this gift was to show him I loved him.. it was TRULY a gift for me. To remind me of what a forgiving, amazing man he is. It came in the mail a couple of weeks ago and I couldn't wait until christmas to wear it lol.. I think this would be a SUPER fun gift to give your best girlfriends. Or your mom, or sisters! It's not something for everyone, but I love it! Another Gift I found.. well two shops had them, were personalized mugs. I am a mug lover. If you ever come visit me in my studio (which I HOPE YOU DO!!) you will see I have a thing for mugs. I collect them. Which I guess is a good thing to collect because then my guests always have something to drink out of! lol. But no seriously even at home, all we drink out of is mugs. We collect them where-ever we go. ALL over the world. But the ones in my art studio I either made myself, or have collected from other artist or on etsy. I saw this mug.. and oh my gosh.. seriously? How could you not fall in love! I emailed the girl and asked if she did custom words.. because I LOVE the word courage right now. But alas.. she said no. So I just ordered 2 of the hope ones. WHich I love the word HOPE as well! They came last week.. and OH MY .. even MORE beautiful in person! Maybe when you come, you can use it! SO.. after I found out she didnt do custom, I HAD to go find something that was, because I wanted to give Ben a mug for christmas too.. one that say "b+c" on it and a heart around it. I finally found THIS awesome etsy store.. and fell in love with these mugs! They actually do a lot more mugs too, ones that look similar to the Hope mug I bought and you can personalize your own words.. HOWEVER I really wanted one with the heart and initials. SO I contacted the artist and asked if it was possible to get the TOP mug.. in that color, but with a heart around it like in the bottom mug AND THEN also add a handcarved b+c in the middle! AND he said YES! for sure! at no extra cost! My mugs arrived a couple of days ago, and they are totally cute and packed (i did open the top and take a peek) but I didn't want to take them out of the boxes to take a picture.. but as you can imagine.. they turned out adorable! "all i did was listen" is a 232-page, full-color, illustrated gift-book, filled with inspiring quotes from rachel's psychotherapy clients, that strung together, tell a story about how healing can happen for all of us. rachel accompanies each quote with a colorful illustration + written reflection"
I don't know Rachel.. but oh MAN I want to meet her someday! Not only is her art beautiful in this book, but the words that are shared or TRULY inspiring! I bought this book sight unseen. I found about about it on one of my facebook group pages. When I visited her etsy store and some some of her art and some of the inside pages I KNEW it would be perfect for all the women in my life this year. This is one of my favorite gifts ever. I am just hoping some of my artist friends who also know her don't always have it! lol. They will just get two.. :) I also got them for some my sisters and other friends who are NOT artist. I know they will truly enjoy it. So.. those are just a few of my "favorites! I have SO many more.. oh you don't even know.. but I better stop.. or this will be a SUPER SUPER long post.. it's already long enough lol. Anyhow.. I'd love to have yous share any awesome finds you have found on etsy this year! post a link in the comments section if you do! It will be fun! I thought today it would be fun to post some handmade christmas ideas.. in honor of the 12 Artsy Ornaments of Christmas workshop starting today! The two they picked were Chrissy's Clay Ornaments (they also loved Alisa's as well).. and Jamie's Coffee filter wreaths.. You can see them here getting their artsy on.. I gave them the supplies and they went to town and I decided to just make some of Chrissy's paperclay ornaments. I LOVE paperclay and I had also seen another paperclay idea on pinterest I wanted to try as well. I wanted to share with you what I (we) ended up making! First off, I LOVE paperclay because it is SOOO much easier to work with than Polymer clay. It's soft and lighter. It air dries.. so you do have to wait overnight to paint them, but it's worth the wait! And usually I get away with letting it dry for only about 30 mins before I paint it and then let it dry the rest of the way overnight. Chrissy teaches in the class how to make your own paper Airdry clay too, with flour and some other ingrediants. There is a trick to it.. but she shares it, so its SUPER easy.. which also makes it SUPER cheap! So I thought it would be fun to not only make ornaments, but also make some "take what you need" hearts.. BOTH as gifts AND for when people come to visit the studio. If you haven't heard of that idea.. Here is a link to that story. Someone made this simple sign on paper and then wrote words on the bottom and cut them into strips. Placed them around her town as an act of charity. SHe called it the "Word" movement. I thought it would be fun to have a bowl of these handmade clay hearts, so when people leave, they can take one with them to not only remember their time there, but also take what they are in "need" of at the particular moment in their life. To remind them to have courage and faith.. to remind them that they are wonderful and beautiful and life is good! "when you are having one of those "days", and I can't be there to help or lend you a hand or shoulder to cry on... take what you need from the jar and know I love you and will ALWAYS be there in spirit!" i love you! xoxox"
You may think 30 hearts sounds like a lot of time. but with the paperclay.. it takes a matter of MINUTES. Seriously minutes. ANd if you don't want to handstamp each one, you can print a paper out with a bunch of words on it and put fun white little word blocks on them instead. I started with just plain ones.. Simple gorgeous cream ones. OH these would be so cute on a burlap and cream christmas tree! Chrissy's were so beautiful I had to just make some plain colored ones! But then of course.. you know me. I HAVE to have color! Actually depending on the person I am giving it to.. they will either be in color, or plain. Some of my friends are totally into the vintage neutrals look.. so the cream ones work out perfect for them! But me.. im a color girl myself! lol. NOt only did I paint them, but I used my Scarlet Lime Doodle Pen to add a little doodling to them as well. So after I got done with that project.. I realized how much I TRULY love paperclay. Honestly. If you haven't ever tried it.. you TRULY should! I saw on pinterest this cute tutorial on how to make your own bird ornaments out of clay as well. It's from a Couple of years ago.. via Jessica Jane! Again Hers were polymer clay. Oven baked. But man oh man that stuff is SO hard to roll and manipulate and I honestly am too impatient to kneed it over and over to make it flexible. Paperclay.. yea it's perfect for me! lol. So after looking some more on pinterest for a bird shape I liked.. here is what I came up with.. I have to say, THESE were a little harder then hearts. I am not very patient as I said, and it does take some patience to smooth out all the sides and make both side symmetrical, etc. SO my bird are a little more "organic" and me. They aren't perfectly shaped all the way around, so they don't sit very well, Some do, Most don't. So if I make them again, I will be more mindful of making the bottom a little more "even" so they can sit better. These i made for ornaments, so I put holes in them, and plan to hang them, so it doesn't quit matter they aren't so perfect. But still. again just used simple stamps, and printed words. Use my acrylic paints and walla! Some of them I plan to leave as birds and just tie to the top of gifts. Others I plan on putting around my studio. We had a lot of fun making clay stuff. The next day, Ben and I had some errands to run and so we took the boys over the studio and let them hang out with Allie and her friends (who had slept there and were STILL there making stuff).. and when we came back with movies and snacks for a family night.. Noah, preston and ethan had all made their own clay things! Noah made two hearts, Preston made a number 8 ball, and ethan made a bunch of hearts as well. THen allie surprised me with an ADORABLE owl she had made for me (she knows I LOVE owls).. SO CUTE!! so I asked her to make me two more. so I could have an owl family..I will have to share when she gets them all painted! if you want to do MORE with clay.. I show you how to make THIS adorable Nesting Ornament.. in the 2012 Artsy Ornaments of Workshop.. (you can still sign up!) It's with clay and a light bulp! AND SO easy! Anyhow.. just a fun post I had to share. THursday I have a post planned to share with you some of the personalized gifts I am giving my friends and family this year.. All that I purchased on etsy.. LOVE buy handmade if I can't make it myself. So check back for that!